With each slightly colder day up north we anticipate getting a newer winter ducks. So far, however, the ducks seem to like their northern temperatures. I guess until a few days ago, we did, too. Winter has arrived, it seems. As I write this I keep looking out the window at all that snow on the ground that blew in last night. The roads are still warm but with a heavily overcast day today the roads will worsen over night. As of early December we’ve had: bufflehead, blue-wing teal, green-wing teal, widgeon, gadwall, black duck, hooded merganser, and common loon and a few others. We’re not usually cursed with iced over ponds although you’ll find a farm pond sometimes with a skim of ice. The bigger lakes and private lakes are usually ice free. More than likely a problem for bird watching is the ice and snow on the back roads. The ducks don’t care. For December we are more likely to get rain than a snow that sticks. January and February are kind of tough if you are a fair weather birder like me. At Musick’s Campground it has become normal to don wind pants and gloves because the wind always picks up brutally and it’s cold, usually, to begin with! The detail in this photo isn’t really important: a bunch of mallard and a couple of black ducks in the rain on the Rooty Branch road near South Holston Dam. Even though we pulled up stakes early that day (club meeting that night) it was raining a bit more by then and the day’s work had been fairly productive. 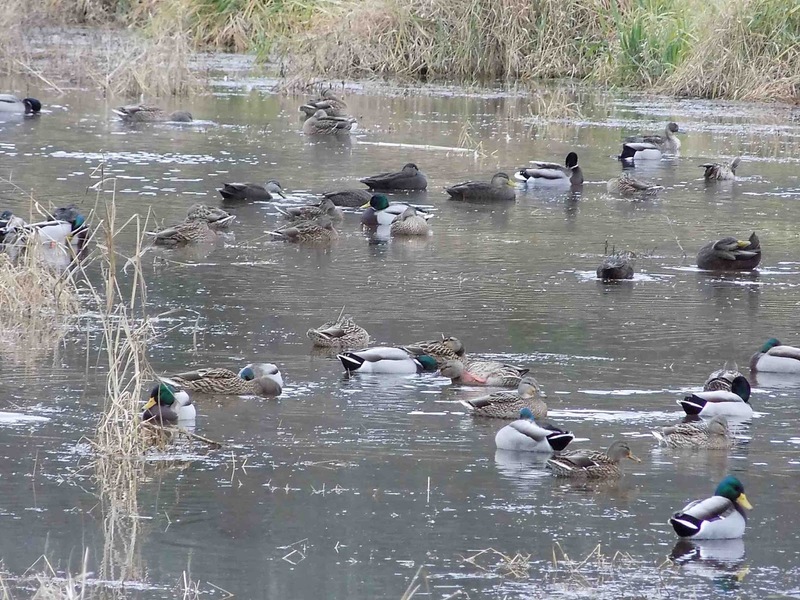 I have condensed Roy Knispel’s compilation of 48 species below: Gadwall, Am. Wigeon, Am. 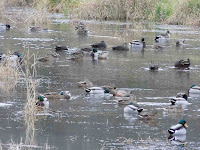 Black Duck, N. Pintail, Green-winged Teal, Bufflehead, Ring-necked Duck, Hooded Merganser, Pied-billed Grebe, Common Loon, Great Blue Heron, Bald Eagle, Sharp-shinned Hawk, Red-tailed Hawk, Am. Kestrel, Ring-billed Gull, Red-headed Woodpecker, Red-bellied Woodpecker, Downy Woodpecker, Hairy Woodpecker, Brown Creeper, Towhee, White-crowned Sparrow, E. Meadowlark. We have a routine of places which work mostly for the winter months: Paddle Creek Pond, Osceola Island/South Holston Dam overlook, Rooty Branch/ Pemberton Road, Musick’s Campground, Middlebrook Lake. During the summer most of these spots become very unproductive. It takes a year to work through all the spots in the five upper east Tennessee counties and even then sometimes two or three or a dozen tries to fill out the list for the year. Eagles on South Holston Lake, October 24.